Sunsets Over The Ocean Will Rarely, But Curiously, Produce A Flash Of? In 1922, Phone Lines In The U.S. Were Silenced To Observe What? There’s a curious atmospheric phenomenon that, if you’re not a life-long sailor or pilot, you’ll likely never see in person. 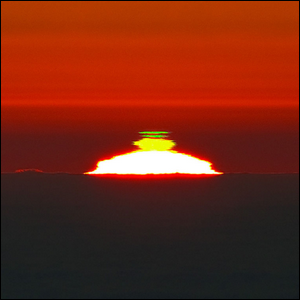 Under the right conditions when the sun is setting below the horizon (or sometimes just before sunrise), a brief but distinct flash of green light resting on the solar disc can appear. While the phenomenon can technically be seen from any elevation and even with an obstructed horizon under very rare conditions, they are most easily observed with a clean view of the horizon like you would have in a plane or from the deck of an oceangoing vessel. The phenomenon is a result of the Earth’s atmosphere scattering the last of the sun’s light (or first of the sun’s light at sunrise) and, through refraction right at the edge of the horizon, the light is separated out like it is shining through a prism. The other shades, like red and yellow, blend into the sunset, but the green light stands out the strongest. The flashes typically last only a second or two, but may occur in rapid succession. As you can imagine, it’s difficult to even be lucky enough to see one, let alone photograph it—the first color photograph of a green flash wasn’t captured until 1960. Image courtesy of G. Lombardi/European Southern Observatory/Wikimedia.